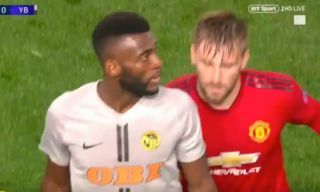 Manchester United left-back Luke Shaw trolled Young Boys ace Jean-Pierre Nsame after helping him off the pitch in last night’s Champions League win. With the score at 0-0, the visitors seemed keen to run down the clock and hold on to what would have been a well-earned point. Nsame tried to run down an extra few seconds before getting into something of a tussle with Shaw as he pushed him towards the touchline to speed him up. The England international then tweeted about the incident with the teasing caption: ‘Just look at it as a last dance mate’. Marouane Fellaini later scored United’s late winner to secure a 1-0 win, ensuring the home team had the last laugh in the end.